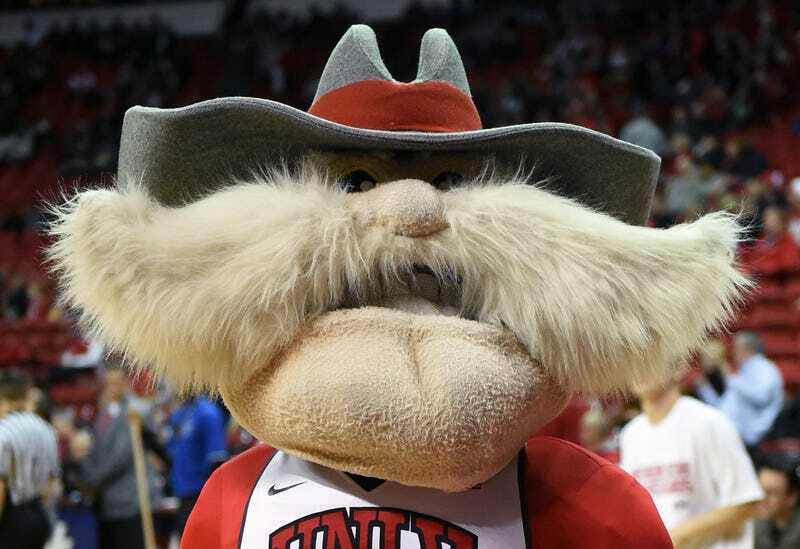 UNLV recently launched a study into the history of its mascot, Hey Reb!, in order to determine if the mustachioed gentleman is racist or not. The resulting report, which makes for an oddly compelling 60 pages, concludes that no, Hey Reb! is not racist, despite many signs suggesting he is. The university’s study was conducted by Rainier Spencer, director of the school’s African-American Studies program, who went into the project expecting to discover a “racist past that we have to apologize for,” according to the Los Angeles Times. What he found instead was a peculiar local history and a bunch of dumbass college students playing dress up. Rather, just like their Rebel parents who had in the first place made the branch possible, what they saw themselves in opposition to was the northern Nevada political power that was preventing their little branch from developing. That political power, not UNR, is what the Confederate symbolism was directed toward. Even if one ignores the reality that the historiography of slavery and the Civil War in the 1950s, at least in terms of popular understandings, was closer to the mythical and reconciliatory writings of Thomas Dixon, Jr. than to the later work of modern-era scholars such as Eric Foner, it nonetheless made little sense to dress the nascent Nevada Southern institution in the garb of the Confederacy except to—from an explicitly southern position on the map—stick a metaphorical finger in the eye of the Nevada’s northern concentration of political power. All of this demonstrates that the immature and undeniably unfortunate Confederates symbolism at Nevada Southern was nonetheless confined to the idea of resisting the political power of northern Nevada, and had nothing to do with any sort of segregationist attitude regarding African Americans, a point that is woefully under-publicized. College kids are so stupid! UNLV’s long awaited mascot will make his debut this Thursday, Dec. 9 in the Las Vegas Convention Center at the UNLV-UNR basketball game. His name is “Hey, Reb,” or “Reb,” or “Mr. Reb,” if you prefer. He’s no slouch at 6-foot-6 inches of Rebel strength and vitality. He’s a mountain man with an oversize hat and rifle, dressed in a long coat with “Hey, Reb!” written on his back; pants with a tall pair of boots; a large belt buckle bearing the initials UNLV; and a large head with a huge handlebar moustache, hat and feather. “Hey Reb’s” outfit was made by costumier Gail Lehtinen of the UNLV theater arts department. “It is a character that well represents a rebel, a mountain man,” said Public Information Services Director Les Raschko. “We don’t think it will be offensive to any particular group. I think this will be well accepted in many, many ways. It has been hyped and timed, and everyone has been very thrilled by what they have seen,” Raschko said. “He has a collegiate atmosphere about him that fits in.” “The character’s trappings can easily be identified with the West. He is a rugged individual, the pathfinder of 100 years ago,” said Mike Miller of Kelly-Reber and Miller Advertising. Miller provided the costume design and all rights to its use for a total fee of $1. “UNLV has been a very good client, and I wanted to put something back into the university,” Miller said. A committee of student government, athletic department, student services and university public affairs representatives selected Miller’s design from a number of submissions. The committee chose “Hey, Reb” because it seemed to best represent the image of a Westerner, rather than a Confederate rebel. So there you go. Hey Reb! isn’t racist. In fact, he was explicitly created to correct the university’s previously ill-advised dalliance with Confederate symbolism.